On March 1, 2019, a joint enlarged meeting of the Anti-Crisis Council of Public Organizations of Ukraine and the Board of the UUIE (Ukrainian union of industrials and entrepreneurs) was held in the Chamber of Commerce and Industry of Ukraine. Among the key issues of the event are the challenges and opportunities for accelerating the country’s socio-economic development in the run-up to 2019; requirements and business proposals to the authorities in defending the priorities of the development of the domestic economy: improving the business climate, overcoming the trends of deindustrialization, stopping the loss of labor potential, etc . ; The “Platform of Economic Patriotism” was updated as the basis for the agenda of joint actions of business and authorities for the current year. A common position was formed between public associations of entrepreneurs, employers, representatives of the expert community and business on solving urgent problems in the real sector of the economy in 2019. The meeting was held with the participation of business associations, employers, representatives of state authorities. 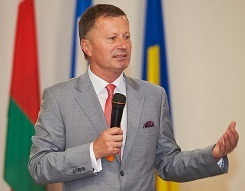 The League of Insurance Organizations of Ukraine at the event was introduced by a member of the Board of the UUIE, President of LIOU Oleksandr Filonyuk. As already reported, the Anti-Crisis Council of public organizations consistently advocated the need to ensure effective public management of the revival of the industrial sector of the economy. League of Insurance Organizations of Ukraine (LIOU) — the most influential association of insurance market of Ukraine, which was established in 1992 to protect the interests of its members and other participants in the insurance market. Over the years, the League of Insurance Organizations of Ukraine has made considerable progress and has authority and respect among insurance companies, public authorities and partner organizations LIOU. League of Insurance Organizations of Ukraine acts on the principles of legality, transparency, autonomy and independence from government agencies, equality of the League members, trust and mutual aid between members of the League.